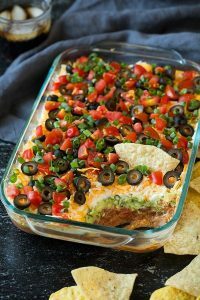 Get ready for the Super Bowl next month with this easy and scrumptious 7-layer dip. It is sure to be a crowd-pleaser! Feel free to add or omit any ingredients to make it exactly what your Super Bowl party needs! In a medium mixing bowl stir together refried beans, canned tomatoes, chili powder, cumin, 1/4 tsp garlic powder and season with salt and pepper to taste (about 1/2 tsp salt/ 1/4 tsp pepper). Spread mixture into an even layer in 7 by 11-inch baking dish. Mash avocado with lime juice. Mix in cilantro and season with remaining 1/4 tsp garlic powder and salt to taste. Spread into an even layer over the bean layer in baking dish, then spread sour cream over avocado layer. Sprinkle with cheese, black olives over sour cream layer then top with tomatoes and green onions. Serve with tortillas chips. Dip can be made a day in advance, just cover and refrigerate until ready to serve.